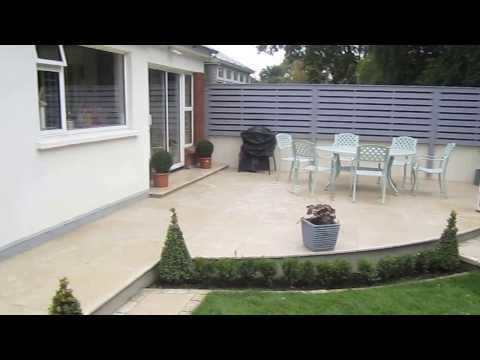 I was recommended to this landscapers contract by a previous client from another landscaping contract in Rathfarnham. The job was for the back garden only. The access to the back was good and posed no problems for transport of materials. 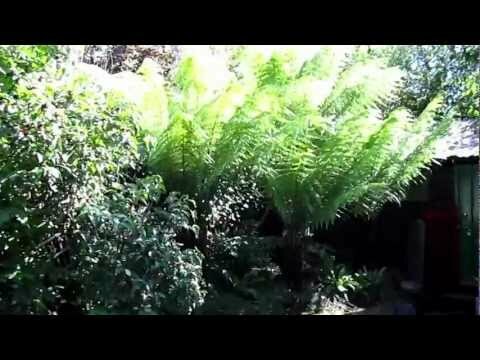 There was an old shed in the corner, two large trees a Eucalyptus and an Acer, the beds had good planting which just needed tidying and a few fillers. The surrounding walls were covered with ivy which looked very well and just needed clipping. The lawn was patchy and needed work. 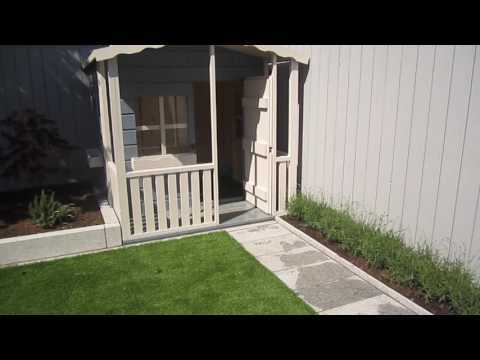 There was no definition between lawn and beds with the lawn encroaching. 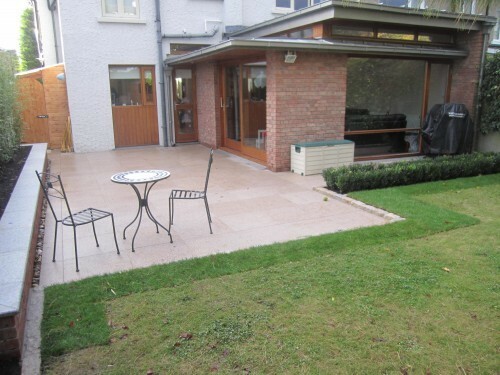 By the new red brick extension there was a large gravel area for seating and a wall which needed softening. The window sills of the extension were silver granite with teak frames. The garden was South facing in aspect so ideal for morning and evening sun. 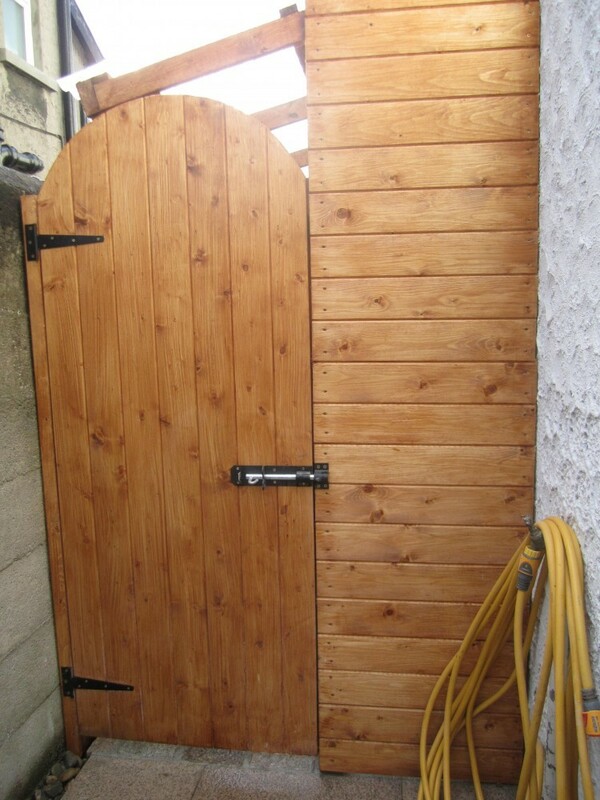 Armed with the above brief I created a simple design which included a bike shelter and side gate finished in teak to match in with extension. 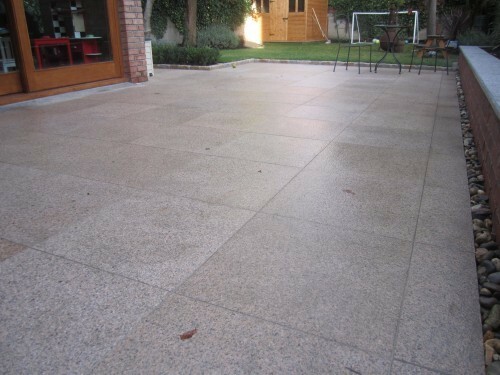 A large patio using 600×600 oatmeal brush hammered granite slabs, which contrasted nicely with the silver granite sills. 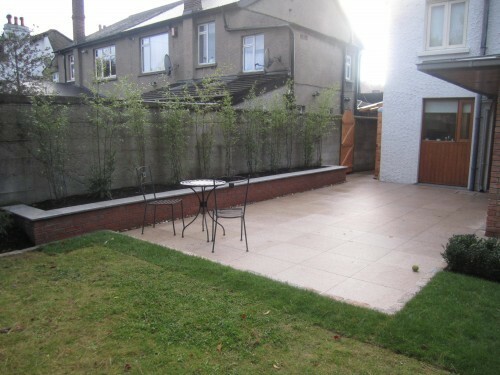 The wall was softened with a raised bed/seat using matching red brick capped with 600x600mm silver granite slabs to further connect with the extension. The edge of the silvcr granite was removed using a half bull nose grinder creating child friendly conditions. At the base of the wall a drainage channel was allowed for, to remove excess water. The channel was finnished with 30-40mmWexford beach pebble further adding to the overall look. 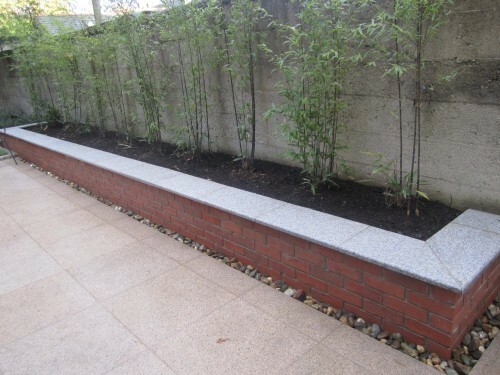 The bed was planted with black stemmed Bamboo which softened the wall and added height. 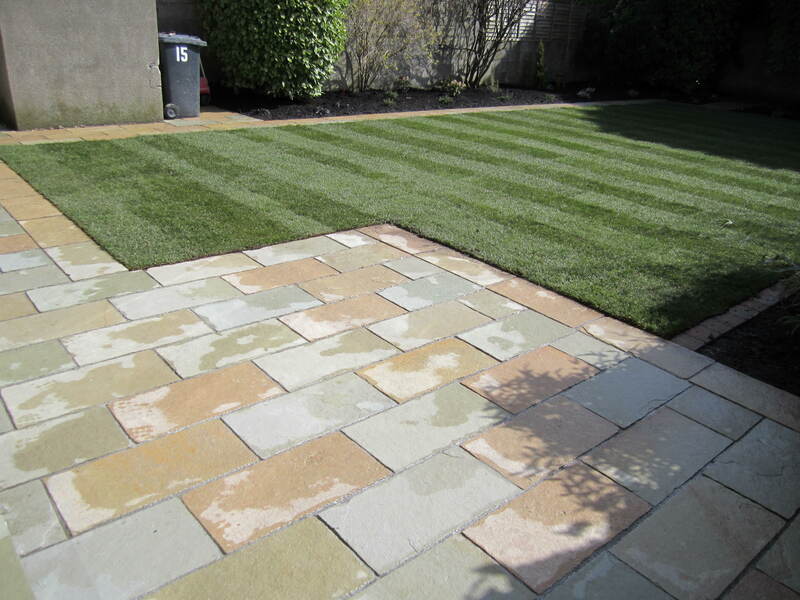 A step using 200x100x100mm tumbled oatmeal cobbles lead up to the lawn area. These tumbled cobbles also served as a mowing edge and connected to the flowing mowing edge around the garden, reducing maintenance and creating definition between lawn and bed. 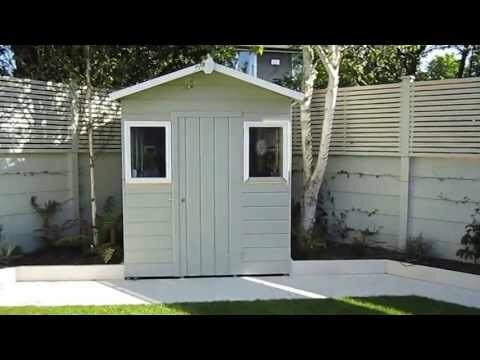 The 8×6 Baumanns garden shed was surrounded with underground steel mesh to stop foxes burrowing, this was further enhanced with an Oatmeal granite and cobble apron. The gaps in the beds were filled with suitable plants that would withstand the dry and shady conditions afforded by the two large trees. Low maintenance was then created with the addition of a 50mm deep mulch within the beds, this mulch would also help with the dry conditions. Finally the lawn was patched up using instant roll out turf. Plants were chosen at Garden World Nurseries, Kilcoole, Co Wicklow. I arrive one hour before the client to choose plants I think are suitable. After being in the garden for the last three weeks i understand the garden and know what plants will thrive in its conditions. When the client arrives I go through the suggested plants and the client gives the yea or nae. 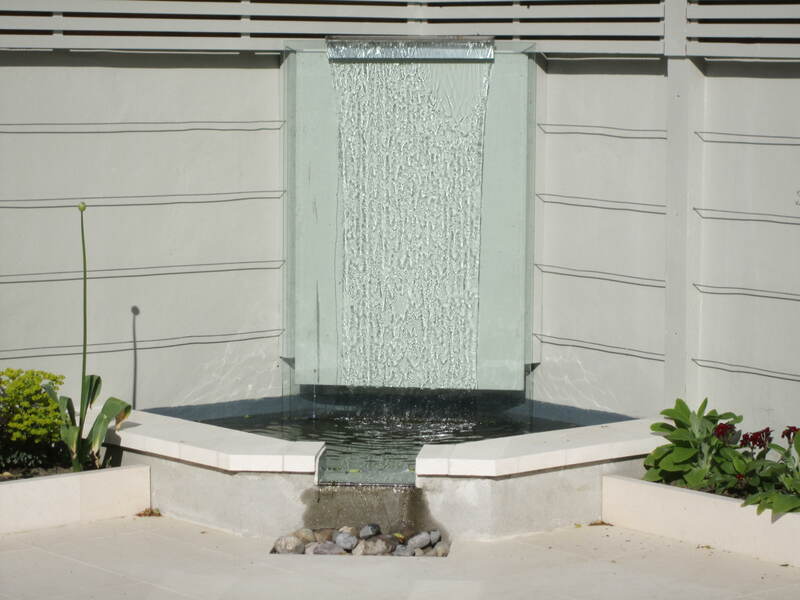 This gives the client control over one of the most important areas in the landscaping of the garden and also recieves a 10% discount and say on money spent. Plants chosen were as follows: Iberis sempervirens, Libertia peregrinans, Convolvulus cneorum, Lavandula hidcote, Nepeta faasenii, Santolina chamaecyparissus, Buxus sempervirens and Phyolstachys nigra. 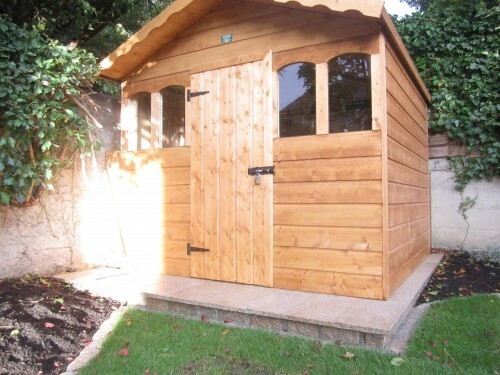 The client was very happy with the overall result achieved and we finished on time and within budget. 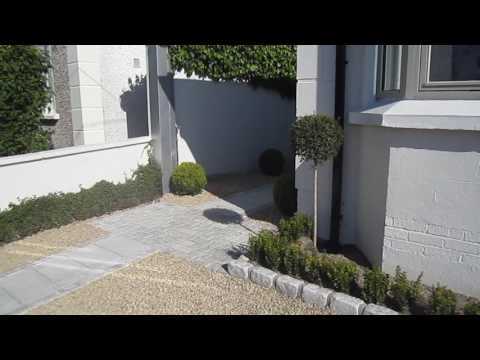 If you require an award winning landscaper/ designer to landscape your garden contact Kevin Baumann on 086 8198444. 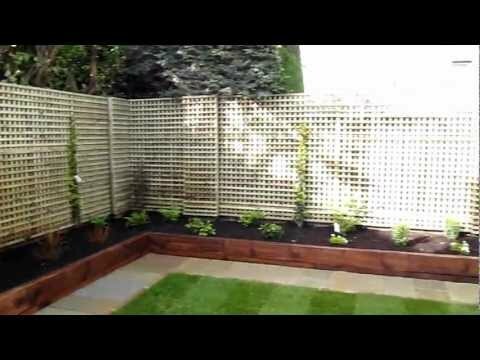 Next: Low Maintenance Gardening Contract, Co Wicklow.